A new monthly Artists' Marketplace popped up on Thursday, August 16, at Rose City Coffee House, in the Brooklyn neighborhood at 3370 S.E. Milwaukie Ave. The initial family-friendly show (5-8 p.m.) featured some twenty artists, accompanied by a song-and-story performance by Olive & Dingo Productions. Shop owner Christie Gryphon welcomed visitors to what she calls the "Third Thursday Brooklyn Marketplace", which she plans to host monthly to showcase local artists. Artists and crafters of all ages set up tables and wall displays around the coffee shop, selling drawings, watercolors, acrylics, chocolates, soaps, magnets, coloring books, pins, and more. Artists included old hands, such as Sherry Dooley, who has sold acrylics painted on wood for over twenty years, to Brooklyn artist Jesse Booker, who has created watercolor images for only a year and a half. Brittany C & Dani Lee offered soaps, wooden spoons, essential oil sprays, soaps & more. Dawn Furstenberg sold black-and-white art and an adult coloring book she'd created. And Tamara Adams presented bright acrylic paintings which she has been sselling at the Portland Saturday Market for eighteen years. Pamela Wanous sold chocolates made in a certified kitchen. One selection, Mocha Meltaways, was made with Rose City Coffee, and will be available on an ongoing basis at the coffee shop. 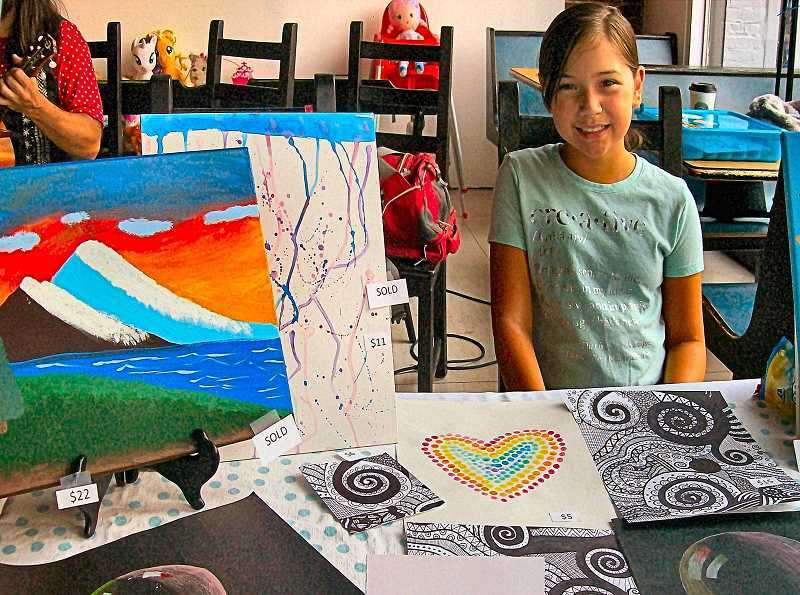 A local kombucha maker sold frosted wares in a corner, and 11-year-old Belle Gryphon – the youngest artist participating – celebrated her birthday by selling artwork done in black and white, and with colored pencils.